Las Vegas is a city that is admired around the world, known for it’s immense structures, bright lights, and dazzling designs. But Vegas didn’t become this way overnight. In fact, it took a long time for it to become such an impressive city, with many massive projects taking place over decades. And, of course, in order to stay the envy of the world, and keep drawing tourists from all corners of the globe, Las Vegas must keep growing, and keep evolving. Much like JackpotCity Casino and other leading online establishments who are always at the forefront of the hottest trends and tech advancements, Vegas needs to move with the times and develop new ways in which to offer visitors an engaging and enjoyable experience, and give them a reason to return time and again too. As it stands, there are a number of projects underway in Las Vegas at this very moment, one of which is set to change the face of the city forever. Las Vegas has one of the most recognisable skylines in the world, with several prominent buildings that can be spotted and identified by almost anyone. So when this skyline gets ready to change forever, you know that some major projects are underway in Sin City. A project that has got many sitting up and paying attention, given how immense it is and its sheer magnitude, is a new performance venue set to be located at Sands Avenue between Koval Lane and Manhattan Street. A new performance venue may not sound like anything major, until you hear about the specifics of the project. The project is being referred to as the MSG Sphere Las Vegas, and will be exactly as the name says; an enormous Sphere. Madison Square Garden and Las Vegas Sands Corp. are coming together to work on the project, and it sounds to be something truly remarkable. The Sphere will sit on 400,000 square feet, and indeed appear to be an enormous sphere from the exterior. Inside, however, will be technology on display never before seen. 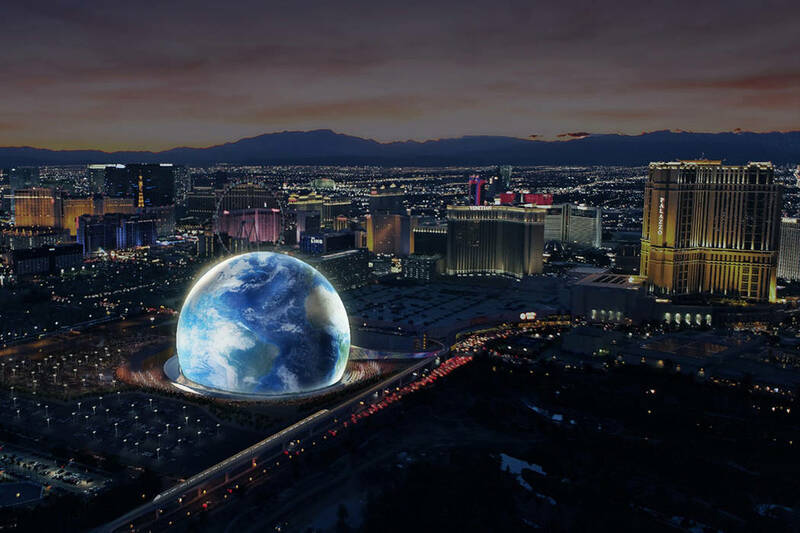 Featuring cutting edge lighting, holographic, and sound design, the MSG Sphere promises to keep Las Vegas a desirable tourist destination and is one of the most impressive projects set to change the Vegas skyline, facelift it’s image, and take it into the future. Given the technological capability of the Sphere, and performances taking place in the venue will take on a new level; something that has never before been seen. Imagine a musical performance that is enhanced in every way by the enormous Sphere, with lighting technology that shifts to make every beat seen, as well as felt. Or story telling, magical acts and theatrical shows that come to life, with the enormous Sphere adjusting it’s appearance to change with the performance. It will all be possible with the Sphere, ushering in a new era of live performance. Construction of the MSG Sphere Las Vegas is due to start this year, with completion being predicted for somewhere in 2020. So it will be some time before shows can be enjoyed in this ground breaking new venue. In the meantime, however, the specifics of the project have been released to the public, giving some idea of how the finished project will be. The height of the sphere will be 360 feet to its tallest point. That’s the very peak of the top of the Sphere. At it’s widest point the Sphere will be a staggering 500 feet, giving an idea as to the shape of the structure. And, to give testimony to the immense technological capability of the venue, a reported 800 miles of fibre-optic cables are being applied to the various lighting, audio visual, and other electronics. Only one question remains, the answer to which is perhaps the most fascinating part of the Sphere’s design. How many people will the venue seat? The answer is 18,000 at full capacity. The kicker of the answer is that all of the 18,000 seats will be facing the stage, in a semi-circular pattern. Given the design of the venue, the performances will be viewable from a much wider angle than a traditional venue, meaning that the audience on the extreme left and right will get as good a performance as those directly in front of the stage. A truly impressive design, and one that will be open to the public in 2020. Many are probably already booking their seats for the debut performance and the Vegas Strip is getting prepped to welcome a brand new era of entertainment.